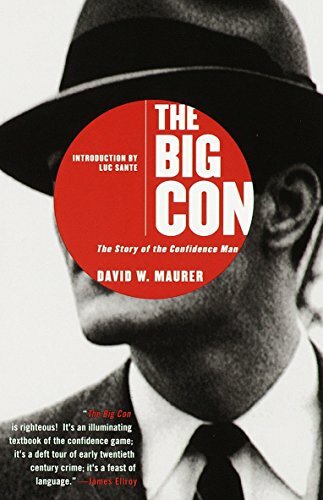 âOf all the grifters, the confidence man is the aristocrat,â wrote David Maurer, a proposition he definitely proved in The Big Con, one of the most colorful, well-researched, and entertaining works of criminology ever written. A professor of linguistics who specialized in underworld argot, Maurer won the trust of hundreds of swindlers, who let him in on not simply their language but their folkways and the astonishingly complex and elaborate schemes whereby unsuspecting marks, hooked by their own greed and dishonesty, were âtaken offâ â i.e. cheatedâof thousands upon thousands of dollars. The Big Con is a treasure trove of American lingo (the write, the rag, the payoff, ropers, shills, the cold poke, the convincer, to put on the send) and indelible characters (Yellow Kid Weil, Barney the Patch, the Seldom Seen Kid, Limehouse Chappie, Larry the Lug). It served as the source for the Oscar-winning film The Sting.